A book reading and signing with Shaun T. Griffin, author of his memoir Anthem for a Burnished Land, will be held at Sundance Books and Music at 6:30 p.m. Wednesday, March 30. Griffin is one of the West’s highly admired poets, and his book reveals his brilliance as a memoirist and reporter of life on the rim of the Great Basin, one of the continent’s emptiest, most beautiful and most threatened places. The vivid memoir of Griffin’s life in Virginia City is both an account of making a home in a historical monument replete with colorful characters, confused tourists and spectacular scenic beauty, and the narrative of his and his wife’s efforts to bring about social change where poverty was considered best left unseen and funds to support services were scarce. Anthem for a Burnished Land (Southern Utah University Press, 2016) is an engaging account of life in one of America’s most storied places, full of powerful insights into the town’s past and present and often-moving stories about its varied residents. Griffin is the co-founder and director of Community Chest, a rural social-justice agency serving children and families in northwestern Nevada since 1991. For over 20 years he has taught a poetry workshop at the Northern Nevada Correctional Center and publishes a journal of the resulting work, Razor Wire. His latest books include This Is What the Desert Surrenders, New and Selected Poems and From Sorrow’s Well: The Poetry of Hayden Carruth. He received the Rosemary McMillan Lifetime Achievement in Art Award in 2006, awarded by the Sierra Arts Foundation, and the Governor’s Award for Excellence in the Arts in 1995. Sundance Books will host a book reading and signing with Michael Archer, author of The Long Goodbye: Khe Sanh Revisited (Hellgate Press, 2016) from 2 to 3 p.m. Saturday, March 26. The book is about Tom Mahoney, unquestionably the most popular member of his platoon, known for his quick smile, courage and composure under fire, and a perpetual concern for the safety of his fellow Marines. It was with anxious fury that his buddies fought the remainder of the day to recover his body from under the effective gunfire of a well-hidden team. As darkness began to fall, making it impossible to continue the fight, they reluctantly left their friend behind—never forgotten and always wondering what had led to his mysterious walk into oblivion. The Long Goodbye is the story of how Michael Archer, driven by loyalty and devotion, returned to Vietnam to discover what had happened to his friend and bring him home. Archer grew up in northern California and served as a U.S. Marine in Vietnam from 1967 to 1968. He lives in Reno and, in addition to his writing, is a staff member with the Senate Committee on Finance at the Nevada State Legislature. His books include A Patch of Ground: Khe Sanh Remembered, an acclaimed first-person account of the infamous 77-day siege of that American combat base; A Man of His Word: The Life and Times of Nevada’s Senator William J. Raggio, about one of Nevada’s most courageous, honorable, and admired citizens; and The Long Goodbye: Khe Sanh Revisited. A newly released nonfiction book from the University of Nevada Press gives its full attention to the animals used by the people in wagon trains. 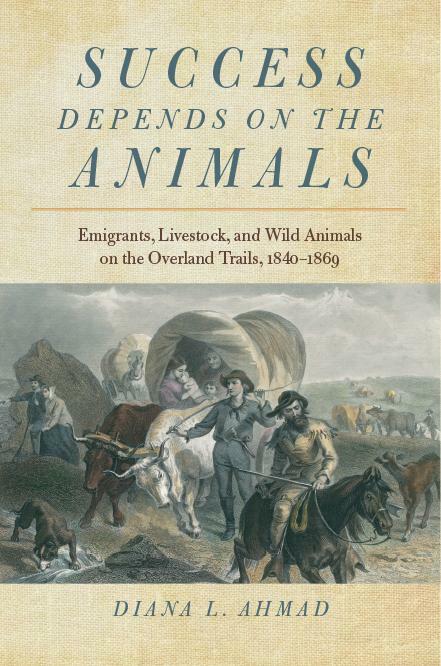 Well, the news release for Success Depends on the Animals: Emigrants, Livestock, and Wild Animals on the Overland Trails, 1840-1869 doesn’t actually use the term “wagon trains,” but I’m using it as shorthand. I’ve always been interested in wagon trains for some reason, and I’ve always felt sorry for the oxen. In the books I’ve read, they didn’t always make it to Oregon or California. And, of course, the emigrants ate many of the wild animals they encountered along the trail. I guess that would be a kind of bond. The author used primary sources such as journals, diaries and newspaper accounts to explore the topic, which is of value whether her intended readers are academics or amateur historians like me. Ahmad received her PhD at the University of Missouri-Columbia. She is a University of Missouri Curators’ Teaching Professor of History at the Missouri University of Science and Technology, where she specializes in the history of the American West, the Pacific and Modern East Asia. She also is the author of The Opium Debate and Chinese Exclusion Laws in the Nineteenth-Century American West. The Gambler’s Apprentice by H. Lee Barnes (University of Nevada Press, 2016) tells the story of a teenage boy growing up in Texas during desperate times. Willy, wise and capable beyond his years, learns the gambler’s trade and experiences adventures that demand quick wits—and sometimes violent actions. Barnes crafts a multi-layered story, full of Old West motifs such as cattle-rustling and gunfights along with more modern twists. Starting with a cattle-rustling scheme involving his father, Willy embarks on a life of crime early, eventually landing in a Laredo jail for shooting a man. During his incarceration he meets Sonny Archer, an itinerant gambler, who teaches Willy how to be a cardsharp. Upon his release, Willy roams the country, honing his new talent and getting into more trouble. During his time in New Orleans, Willy even winds up in a confrontation with an Italian crime ring. While all these adventures mold Willy into a clever card player and a masterful fortune hunter, his grand ambition to be a professional gambler is thwarted when the influenza epidemic strikes. Willy is forced to return home to his family’s Texas ranch, where he faces the most challenging test of his young life and begins to prove that he is far more than simply an apprentice. Barnes is an award-winning short-story writer and author of three previous novels, three short-story collections and two nonfiction books. He was inducted into the Nevada Writer’s Hall of Fame in 2009, and in 2013 he received an award for excellence in the arts from the Vietnam Veterans of America for his writings on Vietnam. Barnes teaches English and creative writing at the College of Southern Nevada. I’m nice. I read. I know how desperate most authors are for book reviews. I know how hard it is to get readers—anyone—to write them. So I should review books here, right? Wrong. And here’s why. I know the authors, or feel as if I do. And some of them know me. We’re friends. Friends are supportive, not judgmental. I don’t want to make authors cry. While authors say they want reviews, they don’t just want reviews. They expect five-star reviews, and many are crushed when they get anything less. It makes me uncomfortable because I don’t always give five-star reviews. Not every book is good, and I have to be honest. Sure, I could find something positive to say about any book, and I could ignore flaws. I won’t, though. I write reviews on Amazon and Goodreads under my own name, and my credibility is important to me. If I give fewer than five stars, I try to provide an explanation or constructive criticism (the things I don’t like might make the book more attractive to someone else). If I don’t like anything about the book, I stop reading it and refrain from reviewing it. I can’t read every Northern Nevada book. I don’t review books without reading them, and there’s no way I would have time to read every book published by Northern Nevada authors, set in Northern Nevada or about Northern Nevada. Actually, I’m being polite. The truth is I don’t find every genre or topic interesting. I’m sorry. Two people (that I know of) plagiarized a review I posted here. I’m sure they were desperate for reviews, but I had put a lot of time into my review and resented the theft. What I try to do here is gather and share information about Northern Nevada books. Although I rarely review them, I post news releases about them. When I get a free copy of a Northern Nevada book (or buy it for myself), I write a “Quick Look”—a summary without a rating. If nothing else, that gives the name and title another place to turn up in a Google search. But I’m not resolving to write more reviews in 2016.